The cornerstone of the STEPS initiative is a new 135,000-square-foot building at the corner of Packer Avenue and Vine Street on Lehigh's Asa Packer campus. The new building is designed to facilitate collaborative learning and eliminate boundaries between the classroom and the lab and features state-of-the-art teaching and research areas mingled with seminar rooms, study lounges and faculty offices. The $62.1 million facility is a "green" building with the goal of LEED certification (Leadership in Energy and Environmental Design), the gold standard for sustainable architecture in the U.S. 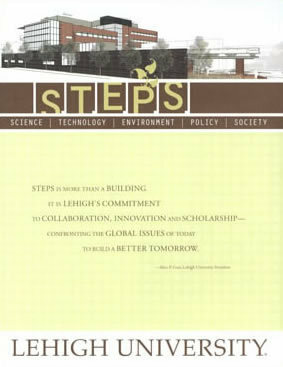 Faculty from earth and environmental science, biology, chemistry, environmental engineering, sociology, political science, international relations, economics, journalism and communication and education are all part of the STEPS initiative. Innovative environmental research conducted by faculty and students is a key part of the STEPS mission.